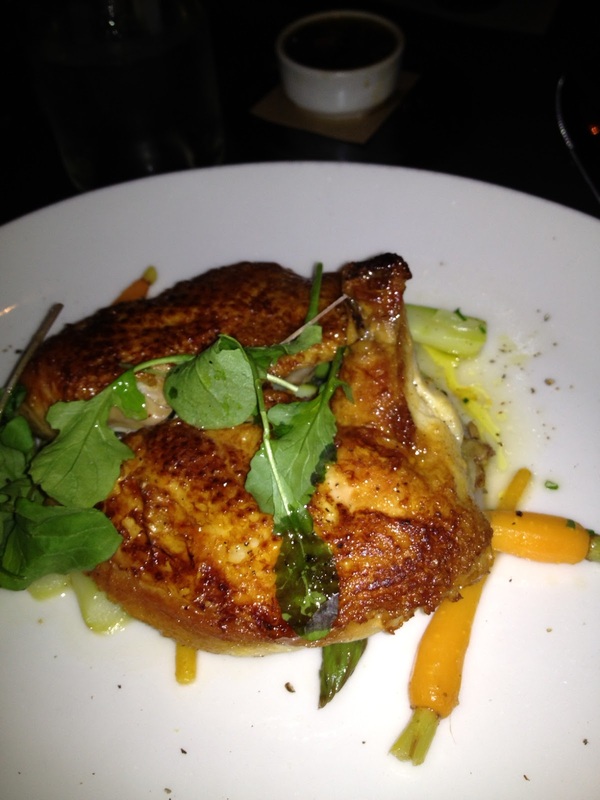 Restaurants that have vegetables other than potatoes on the menu are always welcome. That’s especially true if they include legumes, which offer some protein The only problem is that they tend to prepare vegetables with lots of fat, as no one will eat them otherwise. Witness these two plates from Salumeria Rossi on New York’s Upper West Side. 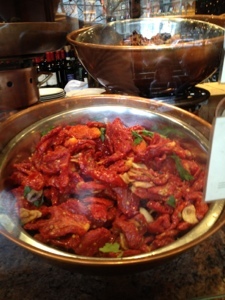 The restaurant’s speciality is mostly Italian meats and cheeses. 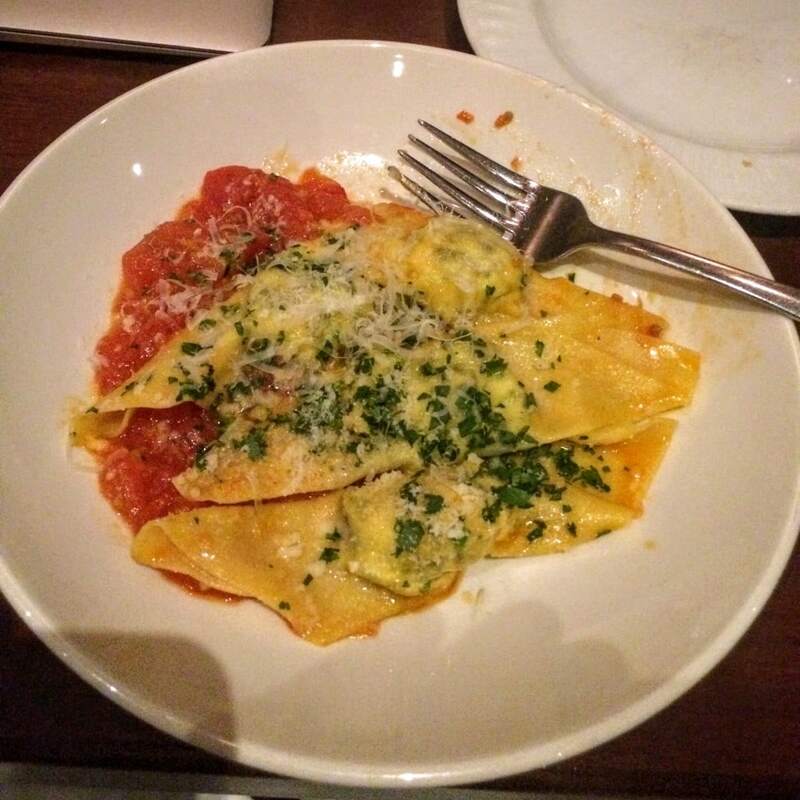 It’s close by our apartment, and The Restaurant Dieter’s spouse has been eager to try it. 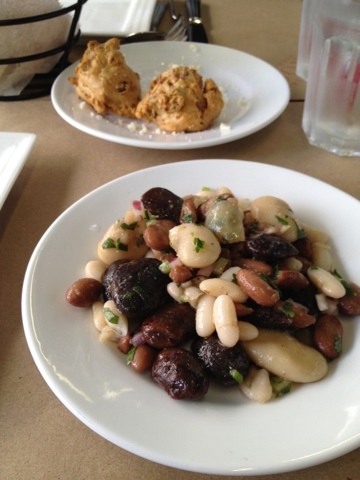 Spotting a caponata and a melange of beans on the menu seemed fortuitous. But what arrived was slathered in oil. Moreover, it was outrageously expensive, even by New York standards. 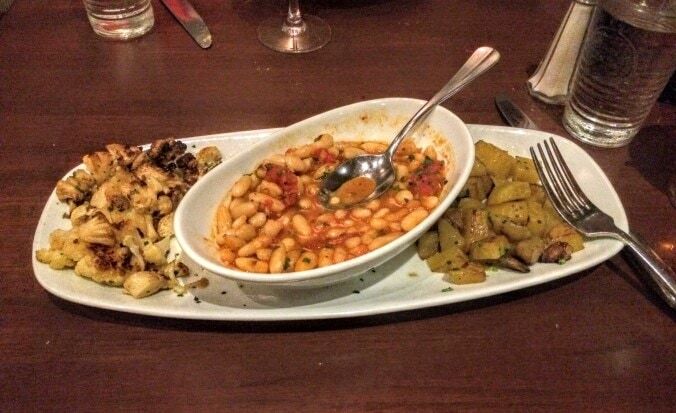 Nine bucks each for a plate of beans and a cup of eggplant? Review: No. 246 in Decatur, Ga. and Bocado in Atlanta: Bring on the fat. Yawn. Restaurants like the hot, hot No. 246 in Decatur Ga. and Bocado in Atlanta, aren’t diet hostile per se. They’re just a little short on strategies in the kitchen to layer on flavor without layering on fat. All that farm-to-table, local, Italian-ish stuff on the menu relies heavily on butter, oil or other fattening ingredients to impart taste. And in the end, rather than celebrating the ingredients, it’s as if every single dish is buried deep in the folds of a down comforter of fat. Even if you’re not The Restaurant Dieter, it’s got to get boring. Can’t a vegetable like sweet potatoes exist on Bocado’s nightly changing menu without layering in nuts, brown butter or covering brussels sprouts in a bath of EVOO? Why are all the vegetable preparations among the sides at No. 246 fattening? 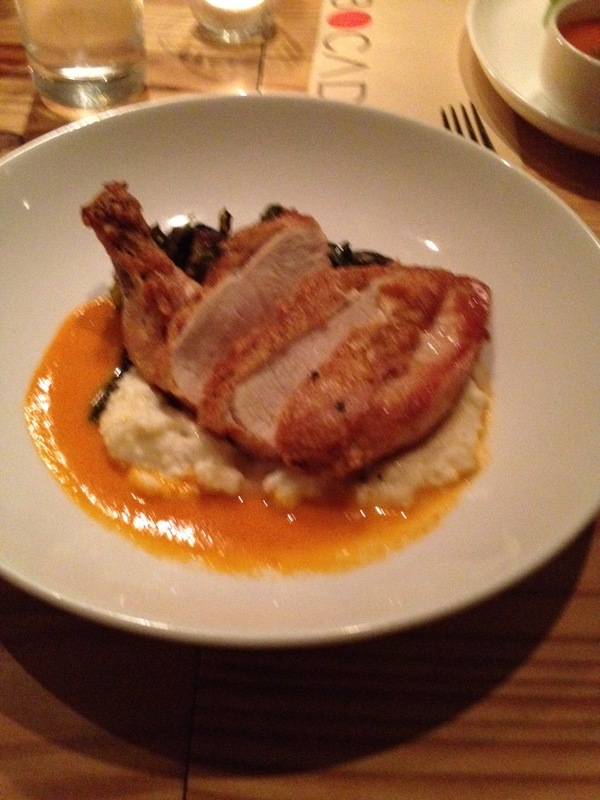 At both restaurants, I ordered the chicken, peeled off the fat crusted skin and ignored the fat transference vehicles such as the grits at Bocado and the bacon-and-sherry sauce at No. 246. Both servers did their best. They cheerfully assented to cheese and dressing “on the side” for salads. At No. 246 it was an uninspired salad with greens, strawberries, farmer cheese and pistachios with a balsamic vinaigrette. 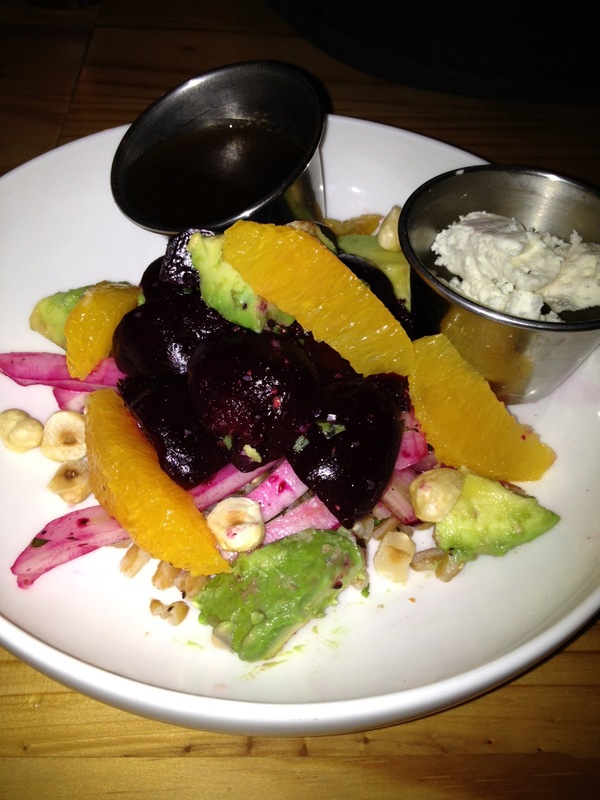 Bocado did better with a salad of beet, orange, avocado, hazelnuts, fennel, faro and a balsamic vinaigrette. The crunchy fennel and orange, combined with just a touch of the feta, both provided a kick that made it even easier to go light on the dressing. If you’re not dieting, throw that down comforter of fat over yourself and go. Yawn. The first paragraph of the “about” page on Lincoln Ristorante’s website is about the building. About its open kitchen architecture and the sloping grass roof one can sit on and take in the Lincoln Center plaza. The second paragraph is about how this restaurant is “a breakout role” for chef Jonathan Benno after 10 years of cooking at the famed French Laundry and Per Se. Accordingly, the second paragraph of this review will be about something. About how the food is pretty average. About how it’s not a very diet friendly menu. 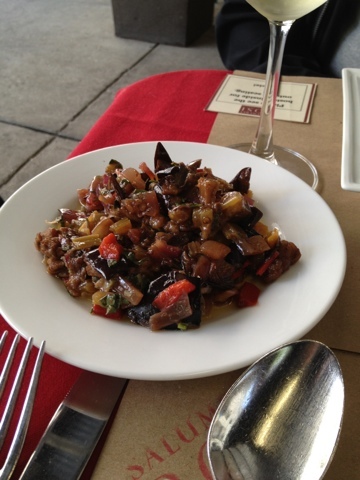 About how a diner or a dieter can do better at any number of Italian restaurants in New York. About how the prices remain crazily high, even with the much-criticized $24 single scallop appetizer off the menu. Heck, about how that open kitchen is really closed in by a giant wall of glass. About the only thing that exceeded expectations were the comfortable swivel chairs. You can swivel slightly sideways, throw your legs out and slink back comfortably in your chair. Our server, asked to identify the most diet-friendly dishes, pointed to the five fish entrees on the menu and then proceeded to describe one where the fish sat atop a pile of sautéed greens. OK, clearly we’re on our own here. I selected an entree of branzino with pole beans and tomatoes. For an appetizer, I selected a mushroom salad with roasted broccoli and potatoes. 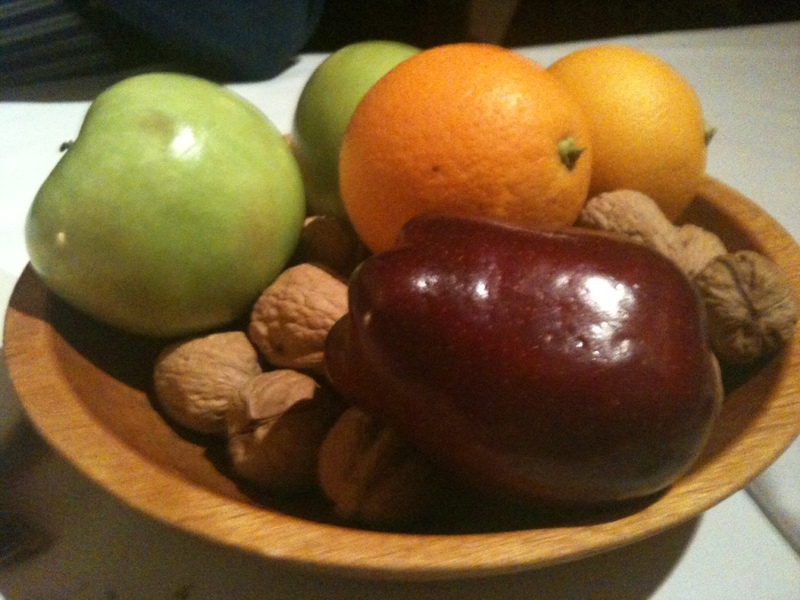 It came with a pine-nut condiment, which the server said could be served on the side. The entire selection aimed for a satisfying meal heavy on fiber-rich ingredients. First to arrive was an amuse bouche which consisted of a two-bite piece of toast with an incredibly salty mushroom topping. Bad sign. You know how I feel about overly salted foods. The salad arrived as requested with the condiment on the side. 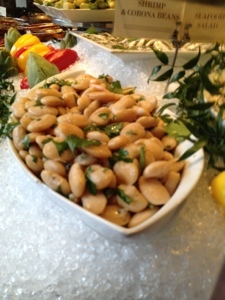 A small bowl held a lumpy brown mixture that our server said consisted of anchovies, pine nuts, olive oil, vinegar, salt and pepper. On the salad or off, it did nothing but add unpleasant bitterness. The salad itself was tiny — a few leaves of greens, three or four broccoli florets, three or four firm white mushrooms and a couple small fingerling potatoes of various colors, halved. At $21, one almost yearned for the $24 scallop bargain. The Restaurant Dieter’s spouse ordered a primi special consisting of a robiola-stuffed ravoli in a béchamel sauce with New Jersey corn (!) and summer truffle shavings. We both miss our pre-diet membership to the Cheese of the Month Club at New York’s Artisanal, so I had to try one. Robiola is gooey, oozy strong cheese. Pairing it with a béchamel and truffles produced a dish that can only be described as cloying. The branzino was a perfectly cooked rectangle, sitting atop a a melange of beans — nicely al dente cranberry beans, a few green and wax beans in a pool of pureed bean, extra virgin olive oil and salt and pepper. A few grape tomatoes provided the overwhelmingly brown dish with some much needed color. It was more successful, but hardly transporting for a $36 entree. 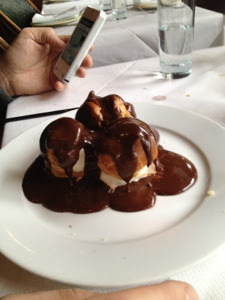 We were sufficiently unimpressed that we passed on desert altogether, so The Restaurant Dieter’s spouse could get a plate for profiteroles across the street at one of our favorite places, Fiorello’s. And this dieter assuaged his disappointment with a giant tartufo. About this, I’ll say little.